... and you have a tendency to die by it! Heroes are rare in the Wasted West, and the servants of the Reckoners would like to keep it that way. The people of the small survivor community of Jarrett, Wyoming had their own homegrown hero, the mysterious Templar, Eliot Ritter. When Jarrett comes under attack by the forces of the Reckoning, Ritter vows to find the forces of the Reckoning, Ritter vows to find the source of the evil and destroy it. He mounts up on a motorcycle, and zooms off to do battle - and that's the last that's seen of him. That's where the posse comes in. It seems Simon Mercer, the Templar's Grand Master, has had a disturbing vision about Ritter's sword - a sword that in the wrong hands could give the Reckoners a big boost (as if they need it). Simon needs someone to find the sword, and fast! 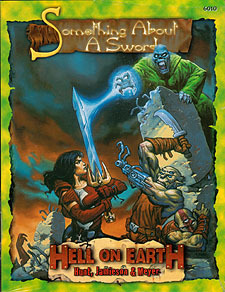 This adventure for the Hell on Earth roleplaying game pits your posse against hideous mutant attacks, rad-priests, and even peace-loving hippies in a desperate race to find the mysterious sword, lost somewhere in the ruins of western Wyoming. Only steely determination, a sharp eye, and a strong sword arm can prevent a terrible menace from being unleashed on the Wasted West. Think you're up to the task, brainer?